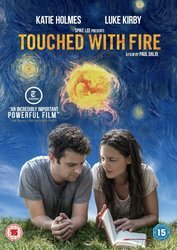 Touched with Fire (out now on DVD) stars Katie Holmes and Luke Kirby as two poets with bipolar disorder whose art is fueled by their emotional extremes. When they meet in a treatment facility, their chemistry is instant and intense, driving each other’s mania to new heights. They pursue their passion, which breaks outside the bounds of sanity, swinging them from fantastical highs to tormented lows until they ultimately must choose between sanity and love. For the chance to win a copy of Touched with Fire on DVD, simply answer the question below.